(1) Claim listing. All of the claims presented in a claim listing shall be presented in ascending numerical order. Consecutive claims having the same status of “canceled” or “not entered” may be aggregated into one statement (e.g., Claims 1–5 (canceled)). The claim listing shall commence on a separate sheet of the amendment document and the sheet(s) that contain the text of any part of the claims shall not contain any other part of the amendment. (3) When claim text in clean version is required. The text of all pending claims not being currently amended shall be presented in the claim listing in clean version, i.e., without any markings in the presentation of text. The presentation of a clean version of any claim having the status of “original,” “withdrawn” or “previously presented” will constitute an assertion that it has not been changed relative to the immediate prior version, except to omit markings that may have been present in the immediate prior version of the claims of the status of “withdrawn” or “previously presented.” Any claim added by amendment must be indicated with the status of “new” and presented in clean version, i.e., without any underlining. (ii) Cancellation of a claim shall be effected by an instruction to cancel a particular claim number. Identifying the status of a claim in the claim listing as “canceled” will constitute an instruction to cancel the claim. (5) Reinstatement of previously canceled claim. A claim which was previously canceled may be reinstated only by adding the claim as a “new” claim with a new claim number. (d) Drawings: One or more application drawings shall be amended in the following manner: Any changes to an application drawing must be in compliance with § 1.84, or, for a nonprovisional international design application, in compliance with §§ 1.84(c) and 1.1026, and must be submitted on a replacement sheet of drawings which shall be an attachment to the amendment document and, in the top margin, labeled “Replacement Sheet”. Any replacement sheet of drawings shall include all of the figures appearing on the immediate prior version of the sheet, even if only one figure is amended. Any new sheet of drawings containing an additional figure must be labeled in the top margin as “New Sheet.” All changes to the drawings shall be explained, in detail, in either the drawing amendment or remarks section of the amendment paper. (1) A marked-up copy of any amended drawing figure, including annotations indicating the changes made, may be included. The marked-up copy must be clearly labeled as “Annotated Sheet” and must be presented in the amendment or remarks section that explains the change to the drawings. Amendments to the specification, other than the claims, computer listings (37 CFR 1.96) and sequence listings (37 CFR 1.825), must be made by adding, deleting or replacing a paragraph, by replacing a section, or by a substitute specification. In order to delete, replace or add a paragraph to the specification of an application, the amendment must unambiguously identify the paragraph to be modified either by paragraph number (see MPEP § 608.01), page and line, or any other unambiguous method and be accompanied by any replacement or new paragraph(s). Replacement paragraphs must include markings to show the changes. A separate clean version of any replacement paragraphs is not required. Any new paragraphs must be presented in clean form without any markings (i.e., underlining). 37 CFR 1.121(b)(1)(ii) requires that the full text of any replacement paragraph be provided with markings to show all the changes relative to the previous version of the paragraph. The text of any added subject matter must be shown by underlining the added text. The text of any deleted subject matter must be shown by strike-through except that double brackets placed before and after the deleted characters may be used to show the deletion of five or fewer consecutive characters (e.g., [[eroor]]). The term “brackets” set forth in 37 CFR 1.121 means square brackets – [ ], and not parentheses – ( ). The text of any deleted subject matter must be shown by being placed within double brackets if strike-through cannot be easily perceived (e.g., deletion of the number “4” must be shown as []). As an alternative to using double brackets, however, extra portions of text may be included before and after text being deleted, all in strike-through, followed by including and underlining the extra text with the desired change (e.g., number 4 asnumber 14 as). For added paragraphs, 37 CFR 1.121(b)(1)(iii) requires that the full text of any added paragraph(s) be presented in clean form without any underlining. Similarly, under 37 CFR 1.121(b)(1)(iv), a marked up version does not have to be supplied for any deleted paragraph(s). It is sufficient to merely indicate or identify any paragraph that has been deleted. The instruction to delete may identify a paragraph by its paragraph number, page and line number, or include a few words from the beginning, and end, or the paragraph, if needed for paragraph identification. Applicants are also permitted to amend the specification by replacement sections (e.g., as provided in 37 CFR 1.77(b), 1.154(b), or 1.163(c)). As with replacement paragraphs, the amended version of a replacement section is required to be provided with markings to show all the changes relative to the previous version of the section. The text of any added subject matter must be shown by underlining the added text. The text of any deleted subject matter must be shown by strike-through except that double brackets placed before and after the deleted characters may be used to show the deletion of five or fewer consecutive characters. The text of any deleted subject matter must be shown by being placed within double brackets if strike-through cannot be easily perceived. (B) Markings to Show the Changes: All claims being currently amended must be presented with markings to indicate the changes that have been made relative to the immediate prior version. The changes in any amended claim must be shown by strike-through (for deleted matter) or underlining (for added matter) with 2 exceptions: (1) for deletion of five or fewer consecutive characters, double brackets may be used (e.g., [[eroor]]); (2) if strike-through cannot be easily perceived (e.g., deletion of number “4” or certain punctuation marks), double brackets must be used (e.g., []). As an alternative to using double brackets, however, extra portions of text may be included before and after text being deleted, all in strike-through, followed by including and underlining the extra text with the desired change (e.g., number 4 asnumber 14 as). An accompanying clean version is not required and should not be presented. Only claims of the status “currently amended” or “withdrawn” will include markings. Any claims added by amendment must be indicated as “new” and the text of the claim must not be underlined. (C) Claim Text: The text of all pending claims under examination and withdrawn claims must be submitted each time any claim is amended. The text of pending claims not being currently amended, including withdrawn claims, must be presented in clean version, i.e., without any markings. Any claim presented in clean version will constitute an assertion that it has not been changed relative to the immediate prior version except to omit markings that may have been present in the immediate prior version of the claims. A claim being canceled must be indicated as “canceled;” the text of the claim must not be presented. Providing an instruction to cancel is optional. Canceled and not entered claims must be listed by only the claim number and status identifier, without presenting the text of the claims. When applicant submits the text of canceled or not-entered claims in the amendment, the Office may accept such an amendment, if the amendment otherwise complies with 37 CFR 1.121, instead of sending out a notice of non-compliant amendment to reduce the processing time. Claim 8 (currently amended): A bucket with a greenblue handle. (E) Acceptable Alternative Status Identifiers: To prevent delays in prosecution, the Office will waive certain provisions of 37 CFR 1.121 and accept alternative status identifiers not specifically set forth in 37 CFR 1.121(c). See Acceptance of Certain Non-Compliant Amendments Under 37 CFR 1.121(c), OG (July 5, 2005). Accordingly claim listings that include alternative status identifiers as set forth below may be accepted if the amendment otherwise complies with 37 CFR 1.121. Any changes to an application drawing must comply with 37 CFR 1.84 and must be submitted on a replacement sheet of drawings, even when applicant is only submitting better quality drawings without any substantive changes. Any additional new drawings must be submitted on a new sheet of drawings. The replacement or new sheet of drawings must be an attachment to the amendment document and must be identified in the top margin as “Replacement Sheet.” The new drawing sheet must be identified in the top margin as “New Sheet.” The replacement drawing sheet must include all of the figures appearing on the immediate prior version of the sheet, even if only one figure is amended. The figure or figure number of the amended drawing(s) must not be labeled as “amended.” A marked-up copy of any amended drawing figure, including annotations indicating the changes made, may be included. The marked-up copy must be clearly labeled as “Annotated Sheet” and must be presented in the amendment or remarks section that explains the change to the drawings. A marked-up copy of any amended drawing figure, including annotations indicating the changes made, must be provided when required by the examiner. An explanation of the changes made must be presented in the “Amendments to the Drawings” or the remarks section of the amendment document. If the changes to the drawing figure(s) are not approved by the examiner, applicant will be notified in the next Office action. Applicant must amend the brief and detailed description of drawings sections of the specification if they are not consistent with the changes to the drawings. For example, when applicant files a new drawing sheet, an amendment to the specification is required to add the brief and detailed description of the new drawings. (A) A preliminary amendmentfiled after the filing date of the application, the technical support staff (TSS) will send the notice which sets a time period of two months for reply. No extensions of time are permitted. Failure to submit a timely reply will result in the application being examined without entry of the preliminary amendment. Applicant’s reply is required to include the corrected section of the amendment. (F) A supplemental amendment filed within a suspension periodunder 37 CFR 1.103(a) or (c) (e.g., applicant requested a suspension of action at the time of filing an RCE), the TSS will send the notice which sets a time period of two months for reply. No extensions of time are permitted. Failure to submit a timely reply will result in the application being examined without entry of the supplemental amendment. Applicant’s reply is required to include the corrected section of the amendment. (H) An after-allowance amendment under 37 CFR 1.312, the amendment will be forwarded to the examiner. Amendments under 37 CFR 1.312 are not entered as matter of right. The examiner will notify the applicant if the amendment is not approved for entry. The examiner may attach a Notice of Non-Compliant Amendment (37 CFR 1.121) to the form PTO-271, Response to Rule 312 Communication (see MPEP § 714.16(d)). The notice provides no new time period. If applicant wishes to file another after-allowance amendment under 37 CFR 1.312, the entire corrected amendment must be submitted before the payment of the issue fee. For amendments in ex parte reexamination proceedings see MPEP § 2250 and § 2266. For amendments by patent owner in an inter partes reexamination proceeding, see MPEP § 2666.01 and § 2672. For amendments in reissue applications, see MPEP § 1453. An amendment must be signed by a person having authority to prosecute the application. An unsigned or improperly signed amendment will not be entered. See MPEP § 714.01(a). To facilitate any telephone call that may become necessary, it is recommended that the complete telephone number with area code and extension be given, preferably near the signature. 37 CFR 1.33 (pre-AIA) Correspondence respecting patent applications, reexamination proceedings, and other proceedings (applicable to applications filed before September 16, 2012). When an unsigned or improperly signed amendment is received the amendment will be listed in the contents of the application file, but not entered. The examiner will notify applicant of the status of the application, advising him or her to furnish a duplicate amendment properly signed or to ratify the amendment already filed. In an application not under final rejection, applicant should be given a 1-month time period in which to ratify the previously filed amendment (37 CFR 1.135(c)). A registered attorney or agent acting in a representative capacity under 37 CFR 1.34, may sign amendments even though he or she does not have a power of attorney in the application. See MPEP § 402.03 . If an amendment signed by the applicant is received in an application in which there is a duly appointed attorney or agent, the amendment should be entered and acted upon. Attention should be called to 37 CFR 1.33 in patent applications. Two copies of the action should be prepared, one being sent to the attorney and the other directly to the applicant. The notation: "Copy to applicant" should appear on the original and on both copies. 37 CFR 1.115 Preliminary amendments. (a) A preliminary amendment is an amendment that is received in the Office (§ 1.6) on or before the mail date of the first Office action under § 1.104. The patent application publication may include preliminary amendments (§ 1.215(a)). A preliminary amendment is an amendment that is received in the Office on or before the mail date of the first Office action under 37 CFR 1.104. See 37 CFR 1.115(a). For applications filed on or after September 21, 2004 (the effective date of 37 CFR 1.115(a)(1)), a preliminary amendment that is present on the filing date of the application is part of the original disclosure of the application. For applications filed before September 21, 2004, a preliminary amendment that is present on the filing date of the application is part of the original disclosure of the application if the preliminary amendment was referred to in the first executed oath or declaration under 37 CFR 1.63 filed in the application. See MPEP § 602. Any amendment filed after the filing date of the application is not part of the original disclosure of the application. See MPEP § 706.03(o) regarding new matter. When the Office publishes the application under 35 U.S.C. 122(b), the Office may include preliminary amendments in the patent application publication. See MPEP § 1121. Because a preliminary amendment to the claims or abstract in compliance with 37 CFR 1.121(c) or 1.121(b)(2) will include a complete claim listing or replacement abstract, the Office can publish the amended claims or the replacement abstract as submitted in the preliminary amendment without a substitute specification being filed. Applicants should note, however, that there is no need to file a preliminary amendment to the claims on filing. By making the new claim set part of the originally filed specification, applicant may avoid having to pay an application size fee, as both the specification (including the claims) and any preliminary amendment are used in counting the number of pages for purposes of 37 CFR 1.16(s). The claim set submitted should be the set of claims intended to be examined, and when the claims submitted on filing are part of the specification (on sequentially numbered pages of the specification (see 37 CFR 1.52(b)(5))), no status identifiers and no markings showing the changes need to be used. A preliminary amendment filed with a submission to enter the national stage of an international application under 35 U.S.C. 371 is not part of the original disclosure under 37 CFR 1.115(a) because it was not present on the international filing date accorded to the application under PCT Article 11. See MPEP § 1893.03(b). Accordingly, a “Notice to File Corrected Application Papers” requiring a substitute specification will not ordinarily be mailed in an international application even if the national stage submission includes a preliminary amendment. For applications filed on or after September 21, 2004 (the effective date of 37 CFR 1.115(a)(1)), a preliminary amendment that is present on the filing date of the application is part of the original disclosure of the application. Any preliminary amendments should either accompany the application or be filed after the application has received its application number and filing date so that the preliminary amendments would include the appropriate identifications (e.g., the application number and filing date). See MPEP § 502. Any amendments filed after the mail date of the first Office action is not a preliminary amendment. If the date of receipt (37 CFR 1.6) of the amendment is later than the mail date of the first Office action and is not responsive to the first Office action, the Office will not mail a new Office action, but simply advise the applicant that the amendment is nonresponsive to the first Office action and that a responsive reply must be timely filed to avoid abandonment. See MPEP § 714.03. If applicant files a preliminary amendment (whether submitted prior to, on or after the filing date of the application) seeking cancellation of all claims in the application without presenting any new claims, the Office will not enter such an amendment. See Exxon Corp. v. Phillips Petroleum Co., 265 F.3d 1249, 60 USPQ2d 1369 (Fed. Cir. 2001), 37 CFR 1.115(b)(1), and MPEP § 601.01(e). Thus, the application will not be denied a filing date merely because such a preliminary amendment was submitted on filing. For fee calculation purposes, the Office will treat such an application as containing only a single claim. In most cases, an amendment that cancels all the claims in the application without presenting any new claims would not meet the requirements of 37 CFR 1.121(c) that requires a complete claim listing. See MPEP § 714. The Office will send a notice of non-compliant amendment (37 CFR 1.121) to applicant and require an amendment in compliance with 37 CFR 1.121. 1. In bracket 1, provide the date that the Office received the preliminary amendment (use the date of receipt under 37 CFR 1.6, not the certificate of mailing date under 37 CFR 1.8). 37 CFR 1.111 Reply by applicant or patent owner to a non-final Office action. (1) If the Office action after the first examination (§ 1.104) is adverse in any respect, the applicant or patent owner, if he or she persists in his or her application for a patent or reexamination proceeding, must reply and request reconsideration or further examination, with or without amendment. See §§ 1.135 and 1.136 for time for reply to avoid abandonment. Where an amendment substantially responds to the rejections, objections, or requirements in a non-final Office action (and is a bona fide attempt to advance the application to final action) but contains a minor deficiency (e.g., fails to treat every rejection, objection, or requirement), the examiner may simply act on the amendment and issue a new (non-final or final) Office action. The new Office action may simply reiterate the rejection, objection, or requirement not addressed by the amendment (or otherwise indicate that such rejection, objection, or requirement is no longer applicable). This course of action would not be appropriate in instances in which an amendment contains a serious deficiency (e.g., the amendment is unsigned or does not appear to have been filed in reply to the non-final Office action). 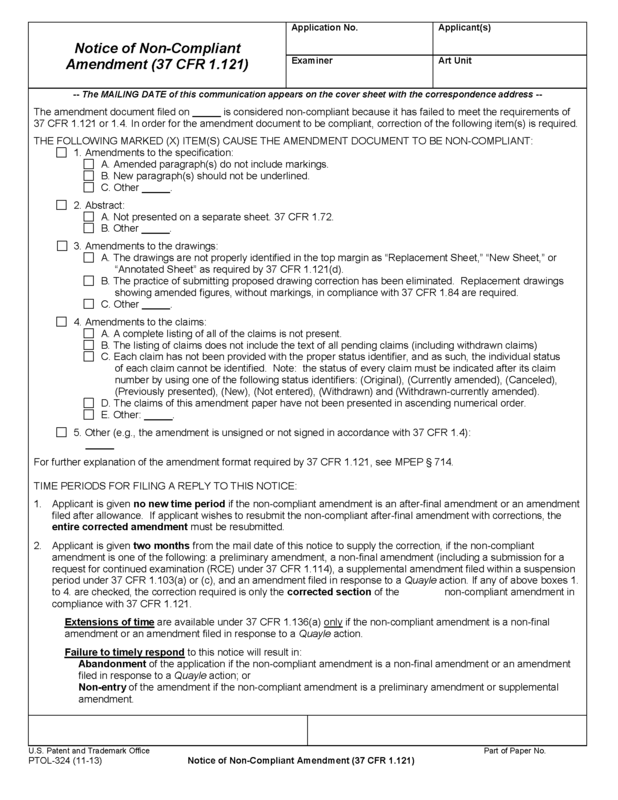 Where the amendment is bona fide but contains a serious omission, the examiner should: A) if there is sufficient time remaining for applicant’s reply to be filed within the time period for reply to the non-final Office action (or within any extension pursuant to 37 CFR 1.136(a)), notify applicant that the omission must be supplied within the time period for reply; or B) if there is insufficient time remaining, issue an Office action setting a 2-month time period to complete the reply pursuant to 37 CFR 1.135(c). In either event, the examiner should not further examine the application on its merits unless and until the omission is timely supplied. Where there is sufficient time remaining in the period for reply (including extensions under 37 CFR 1.136(a)), the applicant may simply be notified that the omission must be supplied within the remaining time period for reply. This notification should be made, if possible, by telephone, and, when such notification is made by telephone, an interview summary record (see MPEP § 713.04) must be completed and entered into the file of the application to provide a record of such notification. When notification by telephone is not possible, the applicant must be notified in an Office communication that the omission must be supplied within the remaining time period for reply. For example, when an amendment is filed shortly after an Office action has been mailed, and it is apparent that the amendment was not filed in reply to such Office action, the examiner need only notify the applicant (preferably by telephone) that a reply responsive to the Office action must be supplied within the remaining time period for reply to such Office action. The practice set forth in 37 CFR 1.135(c) does not apply where there has been a deliberate omission of some necessary part of a complete reply; rather, 37 CFR 1.135(c) is applicable only when the missing matter or lack of compliance is considered by the examiner as being “inadvertently omitted.” For example, if an election of species has been required and applicant does not make an election because he or she believes the requirement to be improper, the amendment on its face is not a “bona fide attempt to advance the application to final action” (37 CFR 1.135(c)), and the examiner is without authority to postpone decision as to abandonment. Similarly, an amendment that would cancel all of the claims in an application and does not present any new or substitute claims is not a bona fide attempt to advance the application to final action. The Office will not enter such an amendment. See Exxon Corp. v. Phillips Petroleum Co., 265 F.3d 1249, 60 USPQ2d 1368 (Fed. Cir. 2001). If there is time remaining to reply to the non-final Office action (or within any extension of time pursuant to 37 CFR 1.136(a)), applicant will be notified to complete the reply within the remaining time period to avoid abandonment. Likewise, once an inadvertent omission is brought to the attention of the applicant, the question of inadvertence no longer exists. Therefore, a second Office action giving another new (2-month) time period to supply the omission would not be appropriate under 37 CFR 1.135(c). The practice under 37 CFR 1.135(c) of giving applicant a time period to supply an omission in a bona fide reply does not apply after a final Office action. Amendments after final are approved for entry only if they place the application in condition for allowance or in better form for appeal. Otherwise, they are not approved for entry. See MPEP § 714.12 and § 714.13. Thus, an amendment should be denied entry if some point necessary for a complete reply under 37 CFR 1.113 (after final) was omitted, even if the omission was through an apparent oversight or inadvertence. Where a submission after a final Office action (e.g., an amendment under 37 CFR 1.116) does not place the application in condition for allowance, the period for reply under 37 CFR 1.113 continues to run until a reply under 37 CFR 1.113 (i.e., a notice of appeal or an amendment that places the application in condition for allowance) is filed. The nature of the omission (e.g., whether the amendment raises new issues, or would place the application in condition for allowance but for it being unsigned or not in compliance with 37 CFR 1.121) is immaterial. The examiner cannot give the applicant a time period under 37 CFR 1.135(c) to supply the omission; however, applicant may obtain additional time under 37 CFR 1.136(a) to file another or supplemental amendment in order to supply the omission. Applicant should submit an argument under the heading “Remarks” pointing out disagreements with the examiner’s contentions. Applicant must also discuss the references applied against the claims, explaining how the claims avoid the references or distinguish from them. 2. Do not use this form paragraph if the supplemental reply has been entered. Use the Office Action Summary (PTOL-326) or the Notice of Allowability (PTOL-37), whichever is appropriate, to indicate that the Office action is responsive to the reply filed in compliance with 37 CFR 1.111(b) and the supplemental reply. 4. In bracket 1, provide the date that the Office received the supplemental reply (use the date of receipt under 37 CFR 1.6, not the certificate of mailing date under 37 CFR 1.8). In the consideration of claims in an amended case where no attempt is made to point out the patentable novelty, the claims should not be allowed. See 37 CFR 1.111 and MPEP § 714.02. An amendment failing to point out the patentable novelty which the applicant believes the claims present in view of the state of the art disclosed by the references cited or the objections made may be held to be not fully responsive and a time period set to furnish a proper reply if the statutory period has expired or almost expired (MPEP § 714.03). However, if the claims as amended are clearly open to rejection on grounds of record, a final rejection should generally be made. Actions by applicant, especially those filed near the end of the period for reply, should be reviewed as soon as possible upon becoming available to the examiner to determine whether they are completely responsive to the preceding Office action so as to prevent abandonment of the application. If found inadequate, and sufficient time remains, applicant should be notified of the deficiencies and warned to complete the reply within the period. See MPEP § 714.03. (A) If the amendment is properly signed (MPEP § 714.01(a)). (B) If the amendment has been filed within the statutory period, set shortened statutory period, or time limit (MPEP § 710 - § 710.05). (C) If the amendment is fully responsive (MPEP § 714.03 and § 714.04) and complies with 37 CFR 1.121 (MPEP § 714). (D) If the changes made by the amendment warrant transfer (MPEP § 903.08(d)). (E) If the application is special (MPEP § 708.01). (F) If claims suggested to applicant for interference purposes have been copied. (MPEP Chapter 2300). (G) If there is a traversal of a requirement for restriction MPEP § 818.01(a)). (H) If applicant has cited references (MPEP § 707.05(b) and § 1302.12). (I) If a terminal disclaimer has been filed (MPEP § 804.02, § 804.03, and § 1490). (J) If any matter involving security has been added (MPEP § 115). 37 CFR 1.52(a) requires "permanent dark ink or its equivalent" to be used on papers which will become part of the record. So-called “Easily Erasable” paper having a special coating so that erasures can be made more easily may not provide a “permanent” copy. However, because application papers are now maintained in an Image File Wrapper, the type of paper is unlikely to be an issue so long as the Office is able to scan and reproduce the papers that were filed. See MPEP § 608.01 for more discussion on acceptable copies. Applicant is required to pay excess claims fees for each claim that is in excess of 3 in independent form or in excess of 20 (whether dependent or independent). Fees for a proper multiple dependent claim are calculated based on the number of claims to which the multiple dependent claim refers (37 CFR 1.75(c)) and a separate fee is also required in each application containing a proper multiple dependent claim. See MPEP § 607. When applicant adds a new excess claim that is in excess of the number of claims that were previously paid for after taking into account claims that have been canceled, applicant must pay the required excess claims fees before the examiner considers the new claim. For example, in an application that contains 6 independent claims and 30 total claims for which the excess claims fees were previously paid, when applicant cancels 10 claims, 2 of which are independent, and adds 11 claims, 3 of which are independent, excess claims fees for a 7th independent claim and a 31st claim are required. 37 CFR 1.116 Amendments and affidavits or other evidence after final action and prior to appeal. (2) Notwithstanding the provisions of paragraph (b) of this section, an amendment made after a final rejection or other final action (§ 1.113) in an ex parte reexamination filed under § 1.510, or an action closing prosecution (§ 1.949) in an inter partes reexamination filed under § 1.913 may not cancel claims where such cancellation affects the scope of any other pending claim in the reexamination proceeding except as provided in § 1.981 or as permitted by § 41.77(b)(1) of this title. (e) An affidavit or other evidence submitted after a final rejection or other final action (§ 1.113) in an application or in an ex parte reexamination filed under § 1.510, or an action closing prosecution (§ 1.949) in an inter partes reexamination filed under § 1.913 but before or on the same date of filing an appeal (§ 41.31 or § 41.61 of this title), may be admitted upon a showing of good and sufficient reasons why the affidavit or other evidence is necessary and was not earlier presented. Once a final rejection that is not premature has been entered in an application, applicant or patent owner no longer has any right to unrestricted further prosecution. This does not mean that no further amendment or argument will be considered. Any amendment that will place the application either in condition for allowance or in better form for appeal may be entered. Also, amendments filed after a final rejection, but before or on the date of filing an appeal, complying with objections or requirements as to form are to be permitted after final action in accordance with 37 CFR 1.116(b). Amendments filed after the date of filing an appeal may be entered if the amendment complies with 37 CFR 41.33. See MPEP § 1206. Ordinarily, amendments filed after the final action are not entered unless approved by the examiner. See MPEP § 706.07(f), § 714.13 and § 1206. It should be kept in mind that applicant cannot, as a matter of right, amend any finally rejected claims, add new claims after a final rejection (see 37 CFR 1.116) or reinstate previously canceled claims. (C) a request for continued examination (RCE) filed under 37 CFR 1.114 with a submission (i.e., an amendment that meets the reply requirement of 37 CFR 1.111) and the fee set forth in 37 CFR 1.17(e). RCE practice under 37 CFR 1.114 does not apply to utility or plant patent applications filed before June 8, 1995 and design applications. See also MPEP § 1206 and § 1211. The U.S. Patent and Trademark Office does not recognize “conditional” authorizations to charge an appeal fee if an amendment submitted after a final Office action is not entered. Any “conditional” authorization to charge an appeal fee set forth in 37 CFR 1.17(b) will be treated as an unconditional payment of the fee set forth in 37 CFR 1.17(b). (D) Since the amendment presents additional claims without canceling any finally rejected claims it is not considered as placing the application in better condition for appeal. Ex parteWirt, 1905 C.D. 247, 117 OG 599 (Comm’r Pat. 1905). It should be noted that under 37 CFR 1.181(f), the filing of a 37 CFR 1.181 petition will not stay the period for reply to an examiner’s action which may be running against an application. See MPEP § 1206 for appeal and post-appeal procedure. For after final rejection practice relative to affidavits or declarations filed under 37 CFR 1.131(a) and 1.132, see MPEP § 715.09 and § 716. Effective December 1, 2003, all official patent application related correspondence for organizations reporting to the Commissioner of Patents (e.g., TCs, the Office of Data Management, and the Office of Petitions) that is hand-carried (or delivered by other delivery services, e.g., FedEx, UPS, etc.) must be delivered to the Customer Window, with a few limited exceptions. See MPEP § 502. Hand-carried amendments and other replies after final rejection (37 CFR 1.116) will no longer be accepted in the TCs. Any courier who attempts delivery of such after final correspondence at a TC (or where it is no longer permitted) will be re-directed to the Customer Window. Patent application related compact disks (CDs) and other non-paper submissions that are hand-carried must be delivered to the Customer Window. Upon receipt by the U.S. Patent and Trademark Office from the U.S. Postal Service of an envelope appropriately marked “Mail Stop AF,” the envelope will be specially processed by the Mail Center and forwarded to the Technology Center after being uploaded as a scanned image into the file wrapper. Upon receipt of the reply in the TC it will be promptly processed by a designated technical support staff member and forwarded to the examiner, via the supervisory patent examiner (SPE), for action. The SPE is responsible for ensuring that prompt action on the reply is taken by the examiner. If the examiner to which the application is assigned is not available and will not be available for an extended period, the SPE will ensure that action on the application is promptly taken to assure meeting the USPTO goal described below. Once the examiner has completed his or her consideration of the reply, the examiner’s action will be promptly typed and printed, and mailed by technical support staff or other Office personnel designated to expedite the processing of replies filed under this procedure. The TC supervisory personnel, e.g., the supervisory patent examiner, supervisory applications examiner, and TC Director are responsible for ensuring that actions on replies filed under this procedure are promptly processed and mailed. The U.S. Patent and Trademark Office goal is to mail the examiner’s action on the reply within 1 month from the date on which the amendment or reply is received by the U.S. Patent and Trademark Office. Under the decision in Ex parteQuayle, 25 USPQ 74, 1935 C.D. 11; 453 OG 213 (Comm’r Pat. 1935), after all claims in an application have been allowed the prosecution of the application on the merits is closed even though there may be outstanding formal objections which preclude fully closing the prosecution. Use form paragraph 7.51 to issue an Ex parteQuayle action. 37 CFR 1.312 Amendments after allowance. (G) a request to change the order of the names of the inventors (37 CFR 1.48(f)), etc. See MPEP Chapter 2300 for the procedure to be followed when an amendment is received after notice of allowance which includes one or more claims copied or substantially copied from a patent. The entry of the copied patent claims is not a matter of right. See MPEP § 714.19. See MPEP § 607 and § 714.16(c) for additional fee requirements. Where an amendment filed with a motion under 37 CFR 41.208(c)(2) applies to an application in issue, the amendment is not entered unless and until the motion has been granted. If the amendment under 37 CFR 1.312 adds claims (total and independent) in excess of the number previously paid for, additional fees are required. The amendment is not considered by the examiner unless accompanied by the full fee required. See MPEP § 607 and 35 U.S.C. 41. The amendment is PROMPTLY considered by the examiner who indicates whether or not its entry is recommended by annotating the amendment with “OK to Enter” if the entire amendment is recommended for entry, with “Enter In Part” if only part of the amendment is recommended for entry, and with “Do Not Enter” if none of the amendment is recommended for entry. The examiner indicates approval of amendments concerning merely formal matters by writing “Enter” thereon with the stamper tool in Adobe Acrobat. Such amendments do not require submission to the supervisory patent examiner prior to entry. See MPEP § 714.16. The Response to Rule 312 Communication form PTO-271 is date stamped and mailed by the TC. If such amendments are disapproved either in whole or in part, they require the signature of the supervisory patent examiner. The general rule that an amendment cannot be entered in part and refused in part should not be relaxed, but when, under 37 CFR 1.312, an amendment, for example, is proposed containing a plurality of claims or amendments to claims, some of which may be entered and some not, the acceptable claims or amendments should be entered in the application. If necessary, the claims should be renumbered to run consecutively with the claims already in the case. The examiner should annotate the amendments by using the Strike-Out Line tool to cross out any refused claims or amendments. The examiner should then submit a Response to Rule 312 Communication form PTO-271 recommending the entry of the acceptable portion of the amendment and the nonentry of the remaining portion together with his or her reasons therefor. The claims entered should be indicated by number in this response. Applicant may also be notified by using form paragraph 7.86. When an amendment under 37 CFR 1.312 is proposed containing plural changes, some of which may be acceptable and some not, the acceptable changes should be entered. An indication of which changes have and have not been entered with appropriate explanation should follow in bracket 2. Handling is similar to complete entry of a 37 CFR 1.312 amendment. Entry in part is not recommended unless the full additional fee required, if any, accompanies the amendment. See MPEP § 607 and § 714.16(c). When an application is not prosecuted within the period set for reply and thereafter an amendment is filed without a petition for extension of time and fee pursuant to 37 CFR 1.136(a), such amendment shall be placed in the file of the application, but not formally entered. The technical support staff shall immediately notify the applicant, by telephone and letter, that the amendment was not filed within the time period and therefore cannot be entered and that the application is abandoned unless a petition for extension of time and the appropriate fee are timely filed. See MPEP § 711.02. See MPEP § 710.02(e) for a discussion of the requirements of 37 CFR 1.136(a). All amendments received in the technical support staff sections are processed and distributed to the examiners. Every mail delivery should be carefully screened so that all amendments replying to a final action in which a time period is running against the applicant are promptly processed (e.g., within the next 24 hours). The purpose of this procedure is to ensure uniform and prompt treatment by the examiners of all applications where the applicant is awaiting a reply to a proposed amendment after final action. In cases of this type, the applicant should receive an Office communication in sufficient time to adequately consider his or her next action if the application is not allowed. Consequently, technical support staff handling will continue to be special when these applications are returned by the examiners to the technical support staff. Evaluation of the amendment after final rejection for compliance with 37 CFR 1.121 should be left to the examiner, and not treated by the technical support staff before forwarding the amendment to the examiner. If the examiner determines that the proposed amendment is not in compliance with 37 CFR 1.121, the examiner should notify applicant of this fact and attach a Notice of Non-Compliant Amendment to the advisory action. See MPEP § 714. Amendments are entered as papers into the IFW. When several amendments are made in an application on the same day no particular order as to the hour of the receipt or the mailing of the amendments can be assumed, but consideration of the application must be given as far as possible as though all the papers filed were a composite single paper. After entry of the amendment the application is “up for action.” It is forwarded to the examiner, and he or she is responsible for its proper disposal. The examiner should immediately inspect the amendment as set forth in MPEP § 714.05. After inspection, if no immediate or special action is required, the application awaits examination in regular order. See MPEP § 714 for the treatment of amendments that are not in compliance with 37 CFR 1.121. (3) Some claims have been allowed and the remainder finally rejected. See MPEP § 714.12 to § 714.14. (B) Substitute specification that does not comply with 37 CFR 1.125. See MPEP § 608.01(q) and § 714.20. (C) A patent claim suggested by the examiner and not presented within the time limit set or an extension thereof, unless entry is authorized by the Director. See MPEP Chapter 2300. (D) While copied patent claims are generally admitted even though the application is under final rejection or on appeal, under certain conditions, the claims may be refused entry. See MPEP Chapter 2300. (E) An unsigned or improperly signed amendment or one signed by a suspended or excluded attorney or agent. (F) An amendment filed in the U.S. Patent and Trademark Office after the expiration of the statutory period or set time period for reply and any extension thereof. See MPEP § 714.17. (G) An amendment so worded that it cannot be entered with certain accuracy. See MPEP § 714, subsection II.G. (H) An amendment canceling all of the claims and presenting no substitute claim or claims. See 37 CFR 1.115(b)(1), MPEP § 711.01 and § 714.01(e). (I) An amendment after a notice of allowance has been mailed in an application, with certain limited exceptions. See MPEP § 714.16. (J) Amendments to the drawing held by the examiner to contain new matter are not entered until the question of new matter is settled. This practice of nonentry because of alleged new matter, however, does not apply in the case of amendments to the specification and claims. See MPEP § 608.04 and § 706.03(o). (K) An amendatory paper containing objectionable remarks that, in the opinion of the examiner, brings it within the condemnation of 37 CFR 1.3, will be submitted to the Deputy Commissioner for Patent Examination Policy. See MPEP § 714.25 and MPEP § 1002.02(b). If the Deputy Commissioner determines that the remarks are in violation of 37 CFR 1.3, he or she will notify the applicant of the non-entry of the paper. (L) Amendments that cannot be scanned or clearly reproduced. See MPEP § 714.07. (M) An amendment presenting claims (total and independent) in excess of the number previously paid for and not accompanied by the full fee for the claims or an authorization to charge the fee to a deposit account or credit card. See MPEP § 509 and § 607. (N) An amendment canceling all claims drawn to the elected invention and presenting only claims drawn to the nonelected invention should not be entered. Such an amendment is nonresponsive. Applicant should be notified as directed in MPEP § 714.03 and § 714.05. See MPEP § 821.03. (O) An amendment including changes to the specification/claims which is not in compliance with 37 CFR 1.121, e.g., one which does not include replacement paragraphs or claim listings. See MPEP § 714. (P) A preliminary amendment that unduly interferes with the preparation of a first Office action. Factors to be considered in denying entry of the preliminary amendment are set forth in 37 CFR 1.115(b). See MPEP § 714.01(e). (Q) A supplemental reply is not entered as a matter of right unless it is filed during a suspension period under 37 CFR 1.103(a) or (c). See 37 CFR 1.111(a)(2) and MPEP § 714.03(a). While amendments falling within any of the foregoing categories should not be entered by the examiner at the time of filing, a subsequent showing by applicant may lead to entry of the amendment. (A) An “amendment” presenting an unacceptable substitute specification along with amendatory matter, as amendments to claims or new claims, should be entered in part, rather than refused entry in toto. The substitute specification should be denied entry and so marked, while the rest of the paper should be entered. The application as thus amended is acted on when reached in its turn, the applicant being advised that the substitute specification has not been entered. Under current practice, substitute specifications may be voluntarily filed by the applicant if he or she desires. A proper substitute specification will normally be accepted by the Office even if it has not been required by the examiner. However, entry of a substitute specification filed after the notice of allowance has been mailed (37 CFR 1.312) is not a matter of right. NOTE. The examiner writes “Enter” with the Stamper tool in Adobe Acrobat in the left margin opposite the enterable portions. If the technical support staff inadvertently enters an amendment when it should not have been entered, such entry is of no legal effect, and the same action is taken as if the changes had not been actually made, inasmuch as they have not been legally made. Unless such unauthorized entry is deleted, suitable notation should be made on the margin of the amendatory paper, as “Not Officially Entered” with the typewriter tool in Adobe Acrobat. If an amendatory paper is to be retained in the file, even though not entered, it should be given a paper number and listed on the file wrapper with the notation “Not Entered.” See 37 CFR 1.3 and MPEP § 714.25 for an example of a paper which may be denied entry. 37 CFR 1.3 Business to be conducted with decorum and courtesy. All papers received in the U.S. Patent and Trademark Office should be briefly reviewed to determine whether any discourteous remarks appear therein. If the attorney or agent is discourteous in the remarks or arguments in his or her amendment or other paper submitted for entry in an application file, either the discourtesy should be entirely ignored or the paper should be submitted to the Deputy Commissioner for Patent Examination Policy for review. See MPEP § 1002.02(b). If the Deputy Commissioner determines that the remarks are in violation of 37 CFR 1.3, the Deputy Commissioner will send a notice of non-entry of the paper to the applicant. At its discretion, the Office may also close the non-entered paper in the IFW of the application or remove the paper from the IFW.